When running for more than two hours it is very important that I stay hydrated and support energy level to keep going. 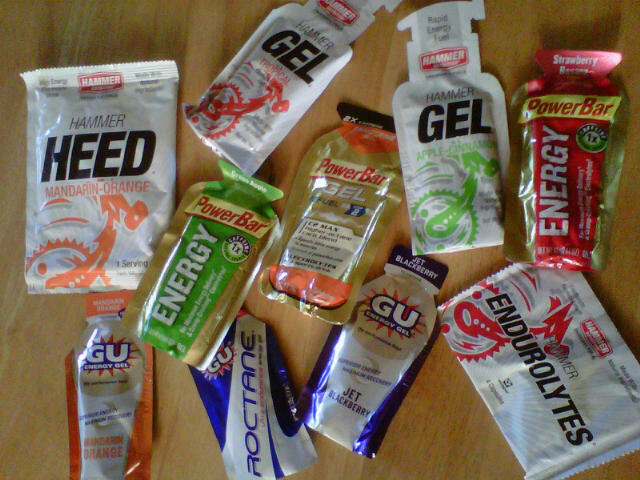 My fuel of choice are gels. They contain calories, potassium, sodium, some sugars and vitamins. They also have carbohydrates and caffeine. Some do have amino acid blends said to help with recovery. Choosing the right one depends on one’s taste in flavor and gel consistency. I have found that because I am eating these while running, I need a flavor that I really enjoy so it won’t make me nauseous and it will go down easy. This weekend we went on a shopping spree and bought all of these. We bought a variety of flavors, brand, amount of caffeine and ingredients. Let the tasting begin! On Sunday (1-9-11) we were scheduled to run 23 miles but because both of my training partners were sick or injured we scaled it back to 16 miles. Thank god!!! After not running for a week, I struggled through that run and became very tired at about the half way point. This weekend, no excuses, it’s the last chance to do 23 miles. Race day is three weeks away, starting to get a bit nervous!